Newcastle United are reluctant to spend more than £12million for Salomon Rondon, according to reports. The Venezuelan has become a real fans favourite in his short spell at St James's Park after joining on loan from West Bromwich Albion. Since his summer switch, Rondon has netted 10 goals to help keep the Magpies above the relegation zone alongside his solid hold-up play to excel in Rafa Benitez's lone striker role. All in all, Rondon has impressed as United's number nine, and talk over recent weeks has surrounded his long-term future on Tyneside. It has been well-documented that the 29-year-old has a £16.5m release clause in his West Brom contract, yet it's a fee Newcastle are hesitant pay. 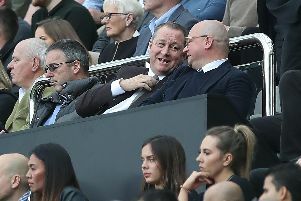 Reports had already suggested Benitez would struggle to persuade the Toon hierarchy to sanction such deal for Rondon as it goes against Mike Ashley's transfer policy. While there is a genuine interest to sign the former Malaga man, the Daily Mail claim the Magpies are unwilling to go above the £12m mark. Benitez admitted he has spoken to Rondon about his future, though told him to concentrate on on-field matters. He said: “Talking about him scoring against Argentina and then losing to Catalonia, I said ‘everyone is talking about your future’, but told him just concentrate on scoring goals, and that’s it. The Daily Mail also say Newcastle have made enquires for Hoffenheim' striker Joelinton. At 22-year-old, the Brazilian is a player who fits the blueprint of the Newcastle board, though are baulked by his reported £45m price-tag. The Magpies, who broke their longstanding transfer record for Miguel Almiron in January, are willing to pay a decent fee for a striker but want one with substantial sell-on value.